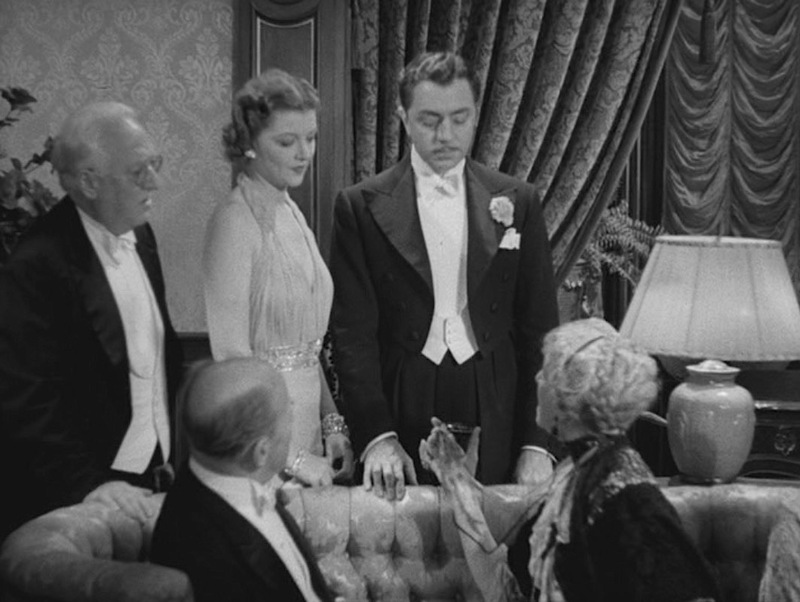 After the Thin Man was released on Christmas 1936 as a continuation of The Thin Man, as its title implies. The all-original story was drafted by Dashiell Hammett himself immediately after the success of the first film, although Hammett had first envisioned circumstances that would send his witty detective duo back to New York City. Eventually, the decision was made to have the Charles couple solving a crime in their hometown of San Francisco. The last we saw Nick was lounging in his silk dressing gown and pajamas while riding the train from New York with Nora. After what must have been a three-year-long train ride, they finally arrive in San Francisco just in time for New Year’s Eve… and a dreaded invitation to the snobby abode of Nora’s elderly aunt Katherine (Jessie Ralph) and her lovelorn cousin Selma (Elissa Landi). The visit quickly turns into an investigation as Nick and Nora are set on the case of finding Selma’s absent husband Robert. Nora: Aunt Katherine wants to speak to you. Nick: What have I done now? Nora: Do you know why Robert wasn’t here tonight? Nick: Sure, because he’s smart. Nora: I’m not fooling, darling, he’s disappeared. 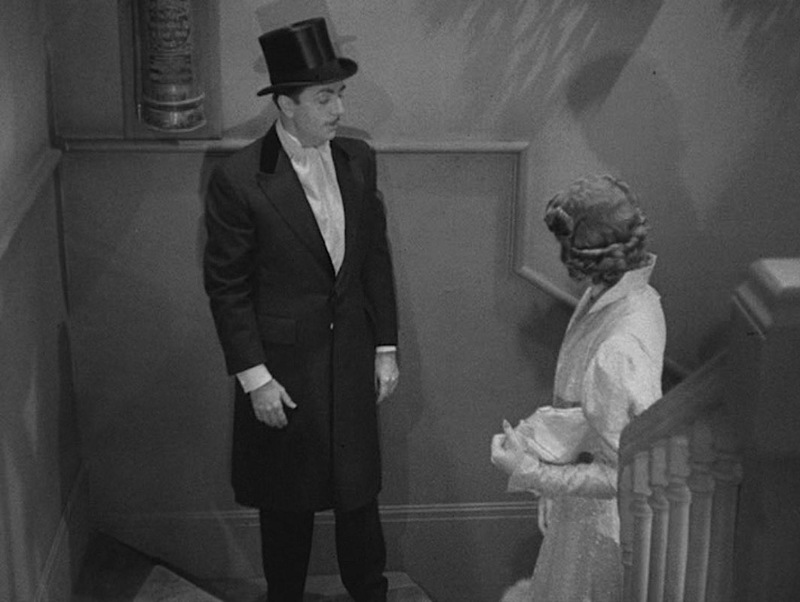 Aunt Katherine is a traditionalist, so a visit to her stuffy Frisco mansion naturally calls for full evening dress, a step above the formality of Nick’s black tie dinner ensemble in The Thin Man. 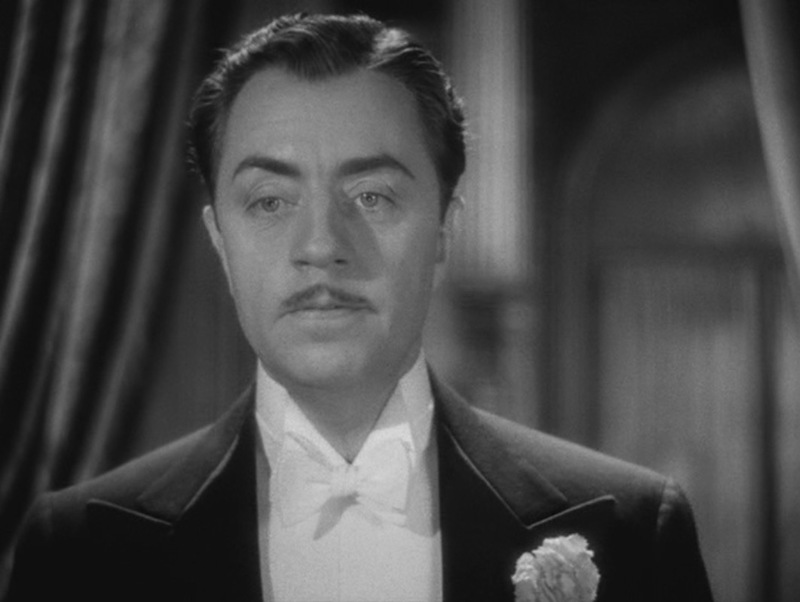 Nick Charles shows up to the Forrest residence in elegant and contemporary “white tie” evening dress, tailored exquisitely to flatter William Powell’s lean figure. The black wool evening tailcoat has wide peak lapels faced in black satin silk and a pink carnation attached to the left lapel. 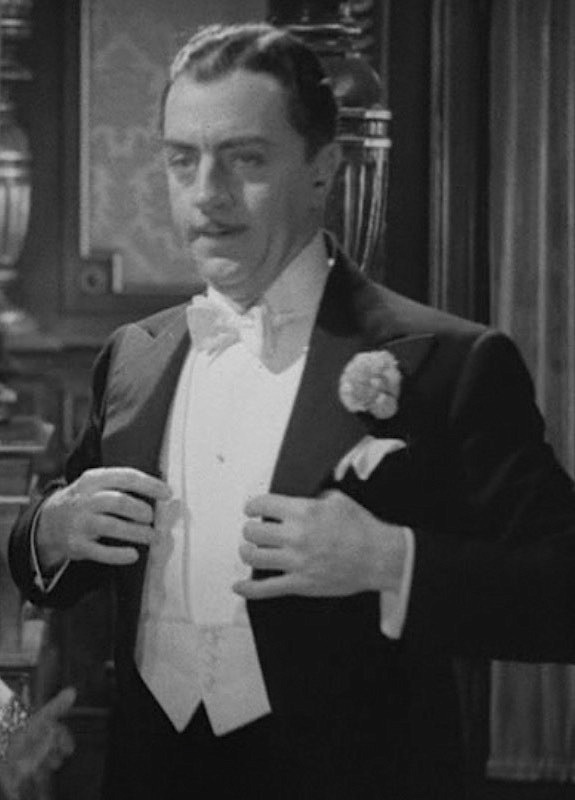 The tailcoat’s only outer pocket is a welted pocket on the left breast, where Nick wears a white linen display kerchief. For more than a century, this type of dress coat (also known as a “claw-hammer coat” or “swallow-tail coat”) had been designed to not fasten in the front, so the six-button double-breasted front with its three satin-covered buttons on each side are purely vestigal. The three buttons on each cuff and two ornamental buttons on the back waist – above the tails – all covered in the same black satin silk. The dress coat is cutaway from the back tails to a square-cut, waist-length front, just long enough to correctly cover the white waistcoat and prevent a disruption in the elegant lines of the outfit. The long sweep of the tailcoat’s wide lapels and the V-shaped button formation work together with the high waisted trousers to enhance the appearance. Nick begrudgingly makes the acquaintance of Nora’s well-to-do relations. Nick wears the traditional white evening shirt with a detachable white wing collar and a stiff marcella bib with a single small, round, pearl-like stud at mid-chest. The stiff single cuffs are each linked with a set of plain white semi-sphere links. Nick takes solace in a highball while gangsters and police battle it out in the Lichee’s back office. The white tie that gives the dress code its name is a traditional thistle-shaped cotton marcella bow tie that Nick wears in front of the wing collar tabs. The white waistcoat had been standardized for full evening dress since the early 20th century when the black waistcoat was relegated to the less formal black tie code. Nick wears a textured white cotton marcella single-breasted low-cut waistcoat with square-cut shawl lapels, three self-covered buttons, two jetted pockets, and a notched bottom. Nick’s formal trousers are black wool to match the waistcoat with double-braided stripes down the side of each leg in black satin silk to match the tailcoat lapels and button coverings. Double braiding has always been traditional for full-dress trousers, although the single side stripe of black-tie formal trousers is also an acceptable alternative. The straight side pockets of Nick’s trousers are cut along the side seams just behind the braiding. 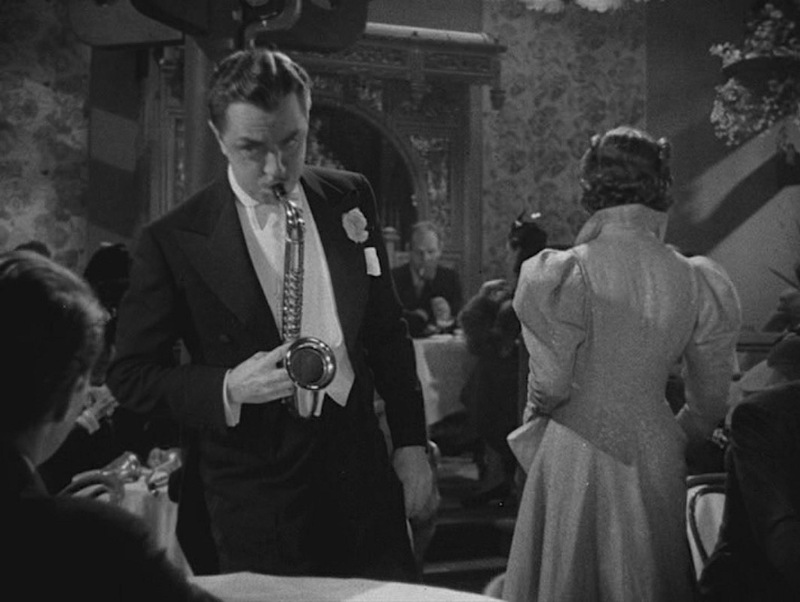 Concealing the trouser waistband is a must with full evening dress, and the ideal high-waisted look (which was also quite fashionable during the film’s 1930s production) ensures that the top of Nick’s trousers are well-hidden above the bottom of his cutaway tailcoat front and waistcoat. Flat front trousers had been the standard leading up to World War I, but postwar fashions of the 1920s and ’30s popularized pleats. Thus, our fashionplate detective sports double forward pleats on his full-dress trousers. Nick is helped out of his overcoat at the Lichee, briefly flashing his coat maker’s label – are any eagle-eyed vintage clothing enthusiasts able to identify it? The full break of Nick’s plain-hemmed trouser bottoms covers the top of his black leather cap-toe oxfords, the most acceptable footwear alternative to the traditional patent leather opera pumps. Nick wears black ribbed dress socks. 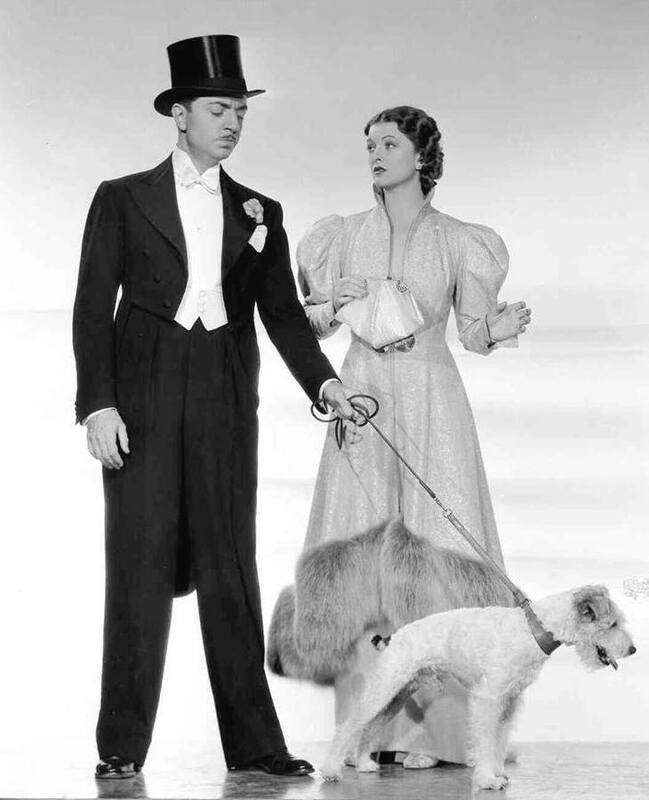 Promotional photo of Myrna Loy and William Powell for After the Thin Man (1936). The homburg was an acceptable headgear alternative for white tie, but Nick spares no formality and opts for the classic black silk top hat with a duller black silk grosgrain band. Nick wears a black wool knee-length Chestefield coat. The peak lapels have a classic formal velvet collar and satin facings to coordinate with the formal evening tailcoat worn under it; this is clearly not a coat to be worn with a business suit. The single-breasted coat fastens with a single cloth-covered button at the waist under a fly front. The cuffs have a short vent but no buttons, and there is a a single welted breast pocket and a widely flapped pocket on each hip. Nick, in full white tie kit with proper outerwear (sans gloves), waits for Nora to enter the Lichee. Nick’s white evening scarf is likely silk with frayed edges. Nick makes the most of the aged Henry’s services. By the 1930s, wristwatches had eclipsed pocket watches as the timepiece of choice for most gentlemen, so the subtle tank watch that Nick wears on his left wrist would not have been a violation of etiquette, especially as it remains relatively unseen. Nick and Nora arrive at the Lichee just as Polly Byrnes (Penny Singleton, later famous for her titular role in the Blondie series) is entertaining a New Year’s Eve crowd with the boisterous “Blow That Horn”. 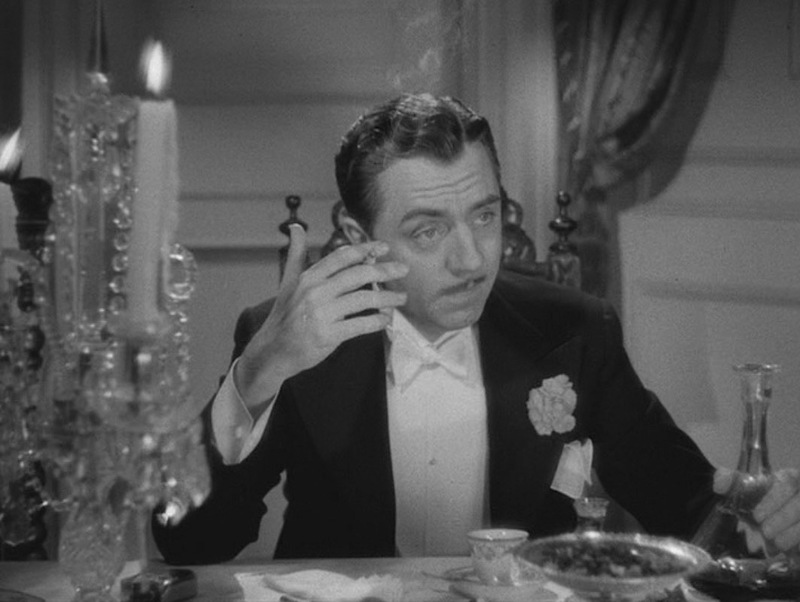 The tempo later slows down for her performance of “Smoke Dreams”, a more romantic ballad written by Nacio Herb Brown and Arthur Freed that makes several appearances throughout After the Thin Man. Of course, when the clock strikes midnight, the band jumps into a jazzy rendition of the traditional “Auld Lang Syne” as couples greet 1937 with kisses and resolutions. Nick: Have you made any New Year’s resolutions? Nora: Not yet. Any complaints or suggestions? Nick: Well, you don’t scold, you don’t nag, and you look far too pretty in the mornings. Nora: All right, I’ll remember: must scold, must nag, mustn’t be too pretty in the mornings. 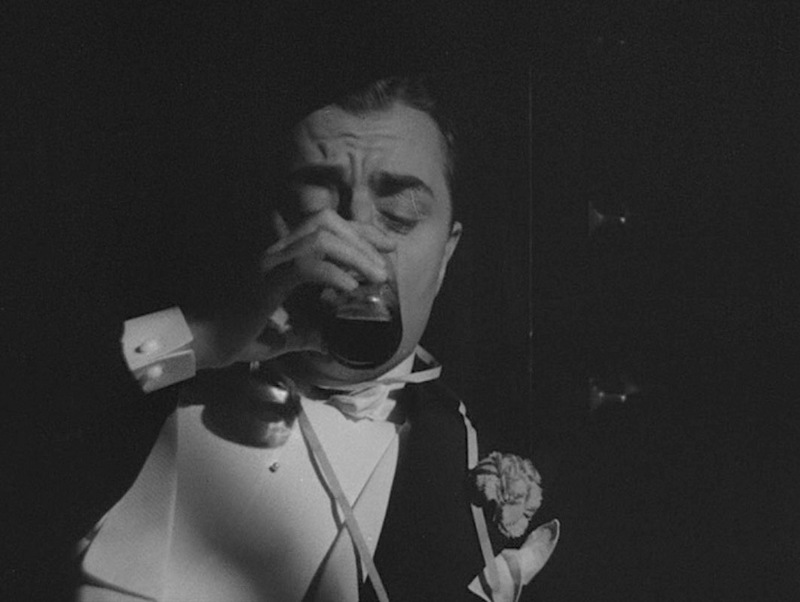 After drowning his sorrows with plenty of brandy at Aunt Katherine’s “soiree”, Nick Charles is more than happy to enjoy the free champagne offered by Dancer (Joseph Calleia) at the Lichee… though Dancer is less than happy when Nick’s party ends up including a number of ex-cons with names like “Willie the Weeper”. 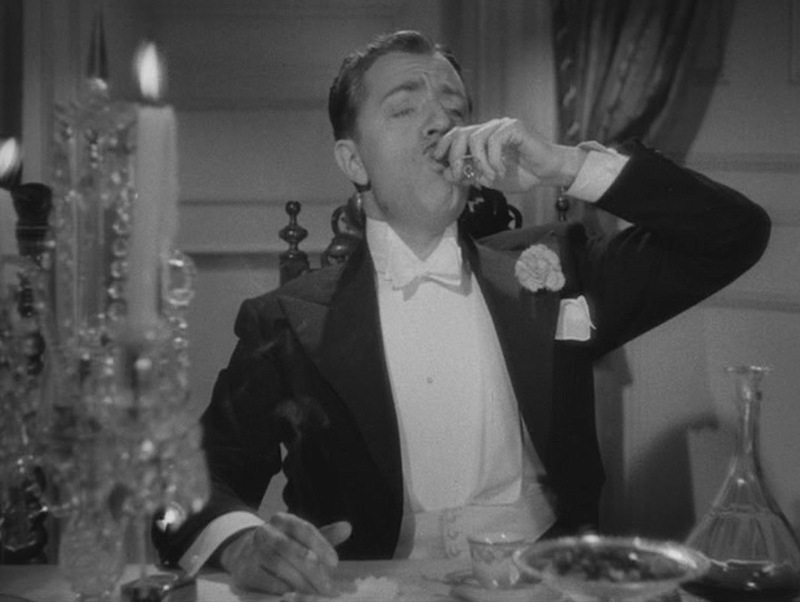 Willie the Weeper: Scotch… with a Champagne chaser. One hand affixed to the brandy decanter, Nick finds ways of entertaining himself in the company of Aunt Katherine’s senile dinner guests before absconding with Nora to the livelier environs of the Lichee. But why do we drink champagne on New Year’s Eve? And how do even troglodytes like Joe know to order it at midnight? Check out this mashed.com article about the history of champagne on New Year’s Eve… and the “villainous compound” of arrack punch that toasted many a new year in the early 1800s. 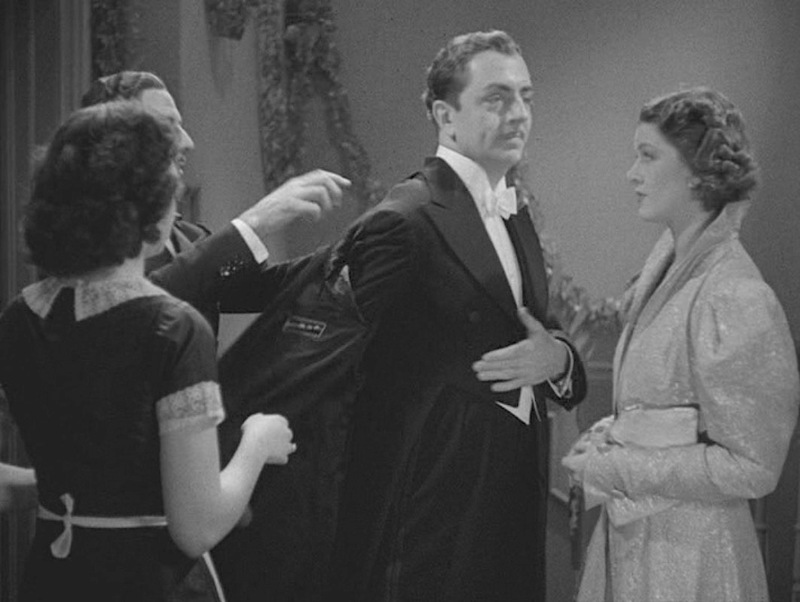 Though full evening dress may be less-than-practical attire for ringing in 2018, the white tie and tails ensemble that Nick Charles (William Powell) wears for New Year’s Eve 1936 in After the Thin Man remains a standard for timeless formalwear should you ever find yourself in a situation calling for the finest of finery. I speculate that Nick wears a black wool tailcoat and trousers, although midnight blue had been a fashionable alternative for more than a decade after the trailblazing Prince of Wales introduced a midnight evening suit that would allow his intricate tailoring to be better noticed in photographs. 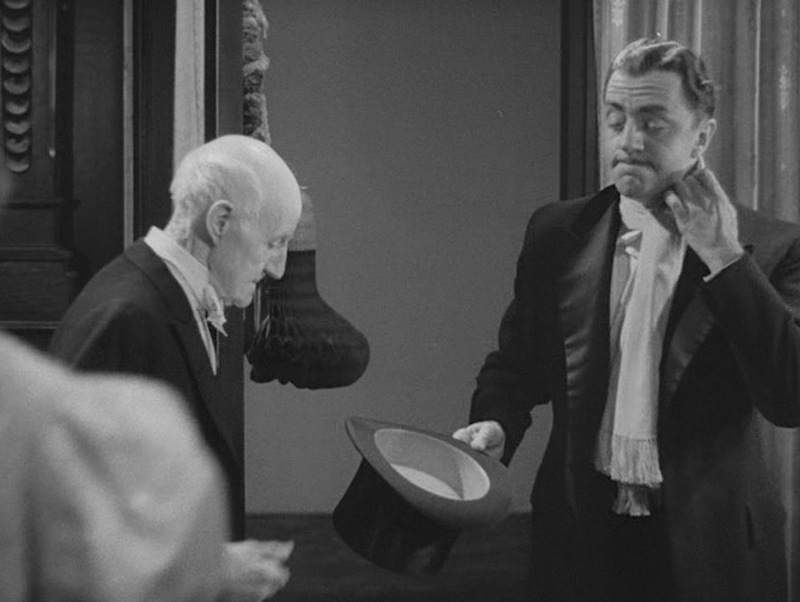 Check out the entire film series and Dashiell Hammett’s original treatments outlining After the Thin Man and Another Thin Man in the single volume released as Return of the Thin Man… significant for being the last fiction that Hammett composed during his life. We want to go someplace and get the taste of respectability out of our mouths. 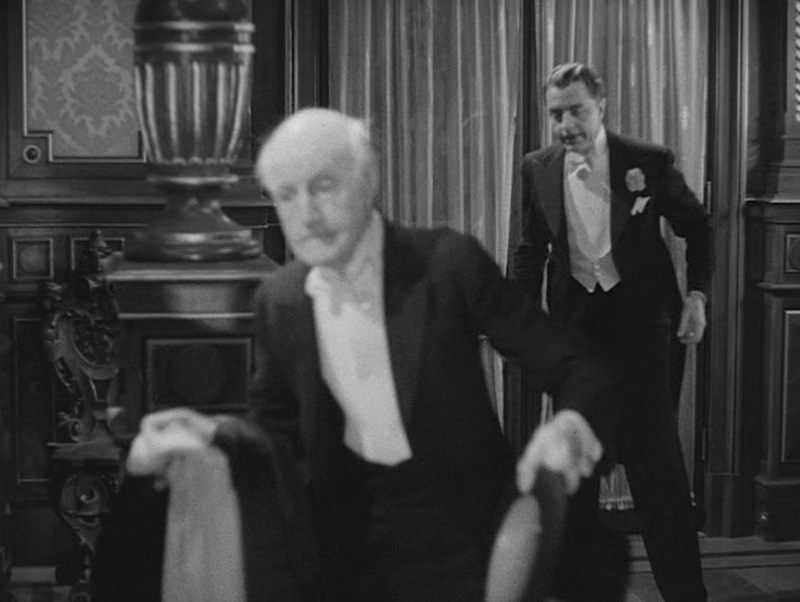 After taking his guest’s hat, coat, and scarf, the elderly Henry the butler directs Nick to follow him, saying “Walk this way, sir,” as he stumbles toward the drawing room. The cheeky Nick, never the sort to miss an opportunity for wit, replies, “Well, I’ll try,” and affects a stagger to his walk as he follows him. I’ll try to hunt up these films to watch. Thanks as always for this article, and a very happy and successful New Year to you in 2018. The overcoat has a fly front? Does that mean the buttons are covered? As always, thank you for your research and post! White tie is all about getting the details – and most especially the fit – right and this certainly does. The height of his wing collar is really hard to get these days, even bought as a separate, but makes a real difference. Interesting that his shoes look as though they might not be patent leather but polished calfskin: unusual in the 30s but a little more refined, in my view. Fly front does mean the coat’s buttons are covered, by the way.